Dominion branded Mitsubishi tracks feature Continuous Wrap Technology which ensures there are no weak points in the track by using a coated single steel cable to construct the track. 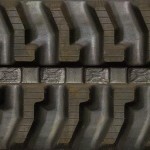 Our Mitsubishi rubber tracks are half pitch tracks with twice as many lugs as a full pitch track. Every sprocket tooth will grab a lug resulting in a smoother and more comfortable ride. Can't Find Your Aftermarket Mitsubishi Replacement Track? If you don't see your model listed on our site call us today at 1-866-759-5557 and talk to one of our knowledgeable salespeople! We can provide you with the assistance you need to find the correct items. Sometimes you need to work with the measurements found on individual tracks, in which case you’ll want to know the dimensions of the track you’re trying to replace. The information in the link above contains useful information on how to determine which track you’ll need. With those measurements, our salespeople can assist you with making the right purchase. • Dominion Rubber Tracks for Excavators and Mini-Excavators carry a one year limited non-prorated warranty against manufacturer's defects. • Dominion Rubber Tracks for Skid Loaders and Dump Carriers carry a six month limited non-prorated warranty against manufacturer's defects. • The Warranty period begins at the date of invoice from Dominion. To read more about our track warranty, see here.